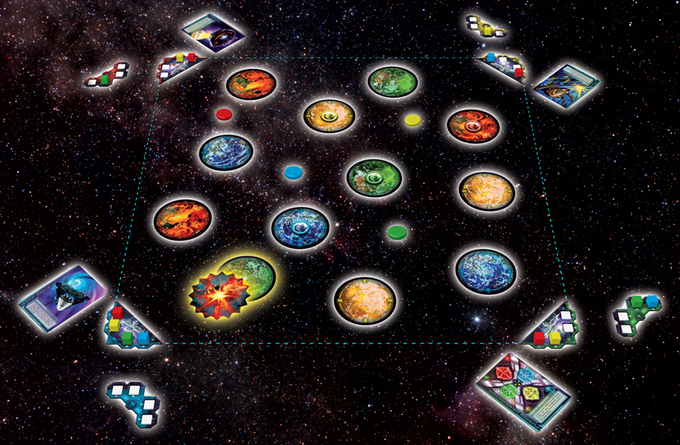 Minion Games’ Cosmic Kaboom is an unusual combination of dexterity and resource collection in a strategic space game. 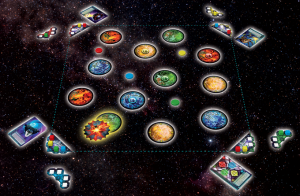 Players flick their space ship discs around the table, collect colored cubes by hitting particular planets, spend sets of cubes to get the space bomb, and then throw the bomb token to blow up planets and collect victory points. Another game with a tossing element is Monstrous. In this one, the players are angry Greek gods, hurling monsters down from the heavens. The monsters (for example, Gorgon, Phoenix, and Hellhound) are represented by cards, which manifest various powers when hitting location cards or other monsters on the table. Location cards (for example, Delphi, Thebes, and The Underworld) provide victory points when hit but may also implicate the cards in a players hand, bonuses at the end of the game, or some other special rule. The designers behind Hyde promise a live-action, horror-themed, bio-activated, puzzle maze. As players work their way through a maze of rooms in an imagined laboratory, they’re trying to solve a mystery of human experiments gone wrong. But what really makes this game special is how bio-sensors worn by the players are integrated with various controls around the maze. Among the typical escape-room puzzles are doors, lights, locks, and motors actuated by players’ breathing, heart rate, posture, and other factors. A control program also tracks players in the maze and will adjust the unfolding story depending on their progress. With the Legendary Planet Adventure Path Legendary Games aims to create a science-fantasy meta-setting for the Pathfinder Roleplaying Game. In other words, it’s background material and a series of adventures with a science-fiction flair but specifically designed as a tie-in to home fantasy campaigns. The first installment sees the player characters escaping from prison using an interdimensional portal. 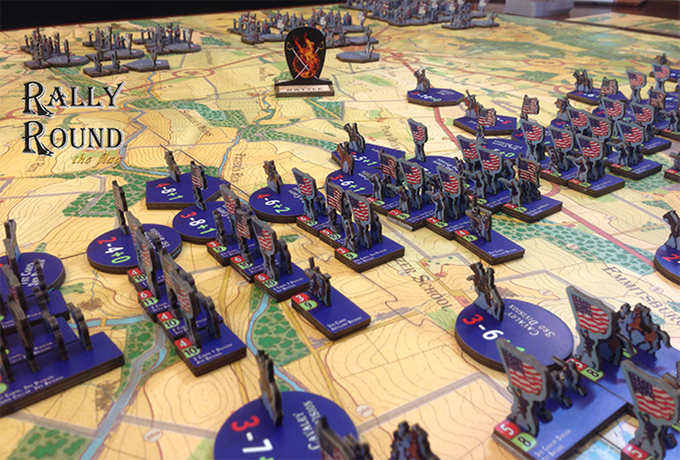 Rally Round the Flag from Lost Battalion Games is a card-driven war game about the Battle of Gettysburg. The game includes amazing card art, standees instead of generic counters, and a deep level of historic detail. It can be played at the division, brigade, or regiment level, with game stats customized to the individual regiments based on historic research. Tackling the business of art is The Gallerist from publisher Eagle and Gryphon Games and designer Vital Lacerda. It’s a large, complex strategy game in which the players buy and sell art, as well as promote and manage their galleries. Individual works of art are featured—paintings, sculptures, photography, and digital art.